We are occupying Wall Street. We will not be moved. Without anyone having to set themselves on fire, a group of nonviolent fed-up people, young and old, has sparked something new. In less than two weeks they have gone through all of the stages of public protest: being ignored, mocked, attacked, and beginning to win. People are joining together across race, age, gender, and culture. Labor unions are joining in a movement that was not begun by labor unions. Insider groups that would rather not be seen at protests are promoting this one. 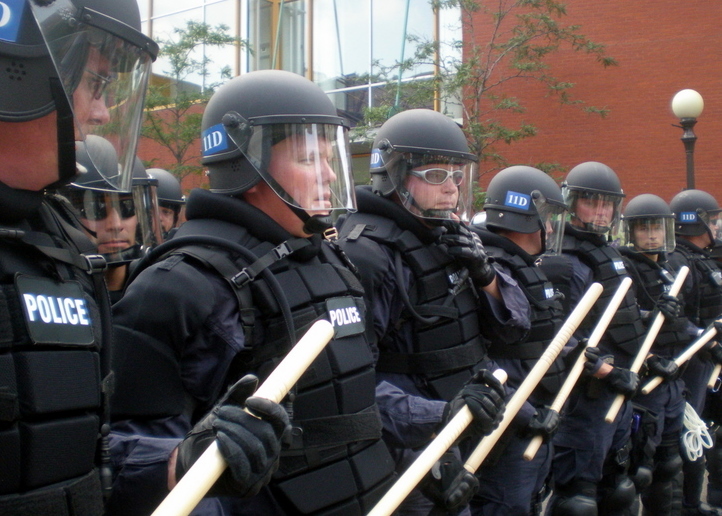 Cable television is denouncing police brutality. A conversation has been launched about the damage the wealthiest one percent is doing to the rest of us. And integral to the demand being made for social justice is the demand to cut military spending and end immoral wars. Now is the moment to nonviolently resist on Wall Street (http://occupywallst.org) and around the country (http://occupytogether.org), and beginning October 6th in Washington, D.C. (http://october2011.org). Wall Street's servants on K Street, in the Pentagon, and in our government think Wall Street is comfortably far away. When agents provocateur commit violence or destroy property at peaceful protests, they are carrying out false flag terrorism. If intelligence agencies or federal, state or local police themselves commit acts of violence against people or property, and then blame it on peaceful protesters, that is - by definition - false flag terror. Read this to see how eagerly the mainstream media are to pin acts of violence on peaceful protesters, instead of the provocateurs who actually committed them. 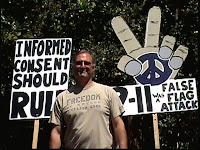 Civil Informationing vs. Last Century's "60's Style Protest Tactics"
Lt. Col. Bob Bowman, speaking on Kevin Barrett's "9/11 and Empire" radio show on WTPRN Radio Network, Dec. 11th, 2007 in Hour 1 of this 2 hour show. Dr. Bob Bowman urges activists to "be as professional, responsible and courteous as possible, as opposed to obnoxious, if we're going to make more inroads!" http://collateral.blip.tv/file/357302/ . It is on the Security and Prosperity Partnership (aka North American Union), but the lessons surely pertain to 9/11 Truth work. * I think that provocateur is an adjective, so have not made it plural. Anybody know? This video was inspired by the amazing efforts and successes of the 9/11 Truth Movement (Who are the "We" in the title), and the urgency for the impeachment and investigation of the Bush Administration et al (Who are the "You" in the title). 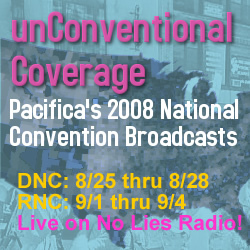 911 TruthSeekers get their chance on the mic! And made it in the Cleveland State University Student paper, 'The Cauldron' Picture and all!!! Nick Chiro said he has been researching the events of Sept. 11 for four years and encourages others to do the same. Banners hung from Cleveland's iconic Free Stamp as protesters lined the street. Business people bustled by, many of them not so much as blinking an eye at the impassioned activists. "You don't want to know the truth!" shouted one protester after a woman refused his offering of a DVD entitled "Loose Change," a documentary that alleges government involvement in the terrorist attacks of Sept. 11, 2001. On Oct. 5, World Can't Wait, an organization dedicated to driving President George W. Bush out of office, held a public rally downtown. Setting up shop in tranquil Willard Park, located right across the street from the Federal Building on Lakeside Avenue, people milled around. Some simply observed, but others actively participated, clothed in anti-Bush attire and armed with myriad selections of literature like the People, a newspaper published by the Socialist Labor Party. Local reggae artist Carlos Jones commented on the bright, but windy day saying it was a sign that "the winds of change are blowing." He then performed a selection of songs including "I Can See Clearly Now (The Rain Is Gone)." Random speakers ascended the stage, each with his or her own reasons why Bush must be ousted from power. "We need to put an end to this phony war on terror," said a man who identified himself as Bernie Chay. "This is a call for the U.S. to be at peace with Iran." He went on to say that the U.S. should not prevent Iran from enriching uranium because the country uses it as a source of power for the betterment of the nation. Nick Chiro, a new member of World Can't Wait, said he has been researching the events of Sept. 11 for four years and it is important for Americans to seek answers and investigate government policies and motives for themselves. "I want to help expose the crimes of Sept. 11 and trace where the evidence truly points," said Chiro. "The 9/11 Commission Report is phony. The people who chaired the committee had many conflicts of interest, so I'm here to speak out for peace and encourage others to investigate for themselves, not just take the words, images and messages from the [Bush] administration or the mainstream media. The greatest form of patriotism is dissent and questioning." Patrick Minnich, an activist yelling at cars and speaking with passersby on Lakeside Avenue, said his main goal is to increase awareness of Sept. 11 and to help Americans realize what really happened. "This is the side you don't see on Fox News," said Minnich, while holding up the DVD "9/11 Mysteries." "[Fox News] is slanted toward one way. They've been talking about going to World War III for a long time now." The message, "Think - it's not illegal yet" was printed in white on his black t-shirt. "It's about the new torture bill just passed that puts people who protest in essentially the same category as terrorists," said Minnich. Several activists pleaded for an end to the capitalist system, which one speaker referred to as the greed-driven cause of war. This year's demonstration at Ground Zero was the largest rally for 9/11 truth to date. The energy was amazing, as 9/11 activists peacefully mingled with other progressive activists, police and fire fighters, those visiting the site of their loss, religious groups, bikers, random onlookers, and even people who were there in a coordinated effort to debunk our assertions. At different times there appeared to be between 600 and 1000 activists attending. Hundreds of people wore black shirts provided by the Loose Change crew, that said "Investigate 9/11." Our presence and purpose were unmistakable to anyone who visited Ground Zero that day. Despite a great deal of aggressive taunting from a few people insulted by our presence, the day went by without any unfortunate incidents. While many in the movement have both academic and political differences, the most compelling overall sense of the experience was one of our unity. When we are all out on the street together, all fighting for the same cause, especially in the eyes of others, all subject to the same prejudice, a lot of our differences seem less important. Let's all hold on to a bit of that feeling as we go back to our various pursuits. Be sure to visit the link for the full article. Thanks Jules for the submission! Just got a first hand report from JR Guerra as to the activities this morning in NYC. First off, he said that the protests at Ground Zero this morning went well. He approximated 2,000 activists at Ground Zero and said there was no provocation and that everyone behaved well. He said that Korey Rowe had handed out 800 copies of LC2E, and 200+ t-shirts. He said that once they had left Ground Zero they went to the financial district to protest in front of Spitzer's office and Silverstein's office, and that the police were very nice and had blocked off all of Broadway street for them. He said that they were currently on the way to city hall and were still running strong with a very large group of protesters. So, since I can't find anyone at all reporting on it I think this is the first report, please post other reports in the comments as you come across them. Big thanks to JR Guerra for the first hand info! Thanks to 911tv for sending this in.